MUMBAI: So close yet so far! The quest for the first title still remains! FC Goa’s dream of clinching the first Indian Super League crown remained unfulfilled as they lost yet another final following their heartbreaking 0-1 defeat against Bengaluru FC, at Mumbai Football Arena, on Sunday. There has to be no final in the Indian Super League with full of drama and late surprises. After playing goalless for almost 117 minutes, Bengaluru FC’s Mumbai-based defender Rahul Bheke headed in a Dimas Delgado corner-kick with just three minutes on the clock, which sank the hearts of the thousands of Goan fans in the Arena and gave Bengaluru FC their first title after finishing runners-up in the previous edition. As the referee blew the final whistle, the pain and emotions were quite visible on the faces of Sergio Lobera and his men and that of the fans too. 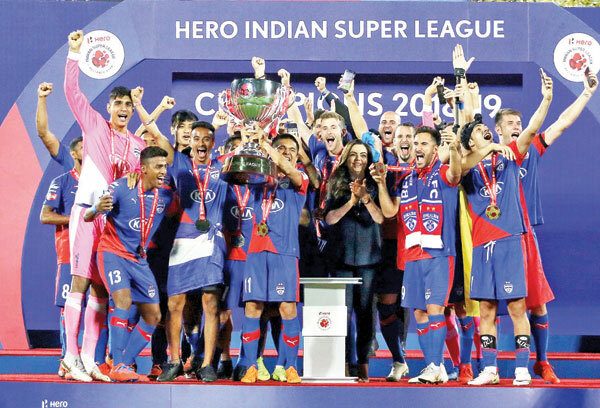 FC Goa were beaten in the final not because they were out-played by Carles Cuadrat’s side who claimed their first title triumph but for reasons to regret of their own and for reasons that will be a maelstrom of frustration on a backdrop of cold hard reality after a remarkable and joyous campaign. An early injury to Mandar Rao Dessai and a red card to Ahmed Jahouh for his silly blunder on Miku, which earned him a second yellow. League’s leading goal scorer Ferran Corominas found it difficult to break past Juan Gonzales, Rahul Bheke and Khabra, though the Spaniard had his moments of magic, but couldn't produce any goals. The stakes were quiet high with both teams playing their second final! However, teams shared almost everything in common! They had lost ISL final. Having arrived in Mumbai showing the rest how far they had come, FC Goa left having been exposed as to how far they still need to go. Having arrived in Mumbai showing the rest how far they had come, FC Goa left having been exposed as to how far they still need to go. Having lost captain Mandar late in the first half, Sergio entrusted his confidence in an inexperienced Saviour Gama, who otherwise managed to put up an impressive performance. FC Goa weren't at their best in the first 45 minutes as Miku, Udanta Singh and Sunil Chhetri made it difficult for the Goan defence. Mourtada Fall and Carlos Pena were kept on their toes for the major part of the first session. However, the Gaurs were rejuvenated in the second half. After all the talk of Gaur’s Lenny Rodrigues, Ahmed Jahouh, Carlos Pena they almost conceded a late goal but luckily Miku saw his strike hit the post in the dying minutes of the game. However, in the extra time, FC Goa’s hopes of claiming their first title received a blow when Ahmed Jahouh was given marching orders for an unnecessary tackle. Not forgetting Naveen Kumar’s brilliant save to deny Francisco Marcos Hernandes just before the half-time whistle. The players wandered aimlessly on the pitch as it became difficult for them to play against a team having a man more in the second AET. Just when it looked like FC Goa would drag the game to the tie-breaker, Rahul came with a breakthrough, when his towering header off Dimas’s corner brushed FC Goa’s keeper Naveen Kumar before entering the net.